The Penguins lost out on a chance to gain a valuable two points yesterday as they were sunk by sub-par goaltending. Hopefully a trip to Buffalo to face the Sabres helps cure the team's ills. Marc-Andre Fleury missed the game against the Lightning due to illness, and the recalled Matt Murray from the AHL this morning. Whether it's a precautionary measure or Fleury cannot make the start again, Zatkoff cannot be trusted to start back to back games for a team desperately needing points, even against the Sabres. There was optimism in Buffalo that the additions to a historically bad 2014-15 team could push the Sabres into the playoff conversation this season. 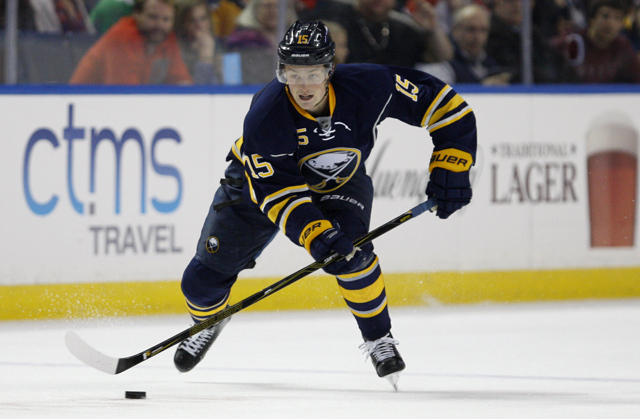 While they've been better, Buffalo is pushing more towards a lottery win than a playoff birth. The Penguins play their second matinee in as many days when they travel to Buffalo to take on the Sabres. It's the 2nd of 3 games between the teams this season, with the Pens winning the first game in Dan Bylsma's return to Pittsburgh, 4-3 in October. The Sabres made a number of big acquisitions to a team they gutted in an attempt to win the 2015 draft lottery. While they ultimately lost out on the top pick to the Edmonton Oilers, center Jack Eichel was a great consolation prize at 2nd overall. The 19-year-old out of Boston University is second on the team with 17 goals and 24 assists in 59 games in his rookie season. Another pair of high profile forward additions have had mixed results so far. Ryan O'Reilly is on pace for a career high in points and assists with an expanded role in Buffalo after being acquired in a summer trade, though his 1.27 pts/60 is his lowest since his first two seasons in the league. Evander Kane came over in a pre-deadline deal that also brought in Zach Bogosian while shipping out Tyler Myers and Drew Stafford. After returning from a season-ending shoulder surgery, Kane hasn't brought the scoring touch his new team was expecting, and his 16 goals and 9 assists give him his worst pts/gm total since his rookie year. Starting goalie Robin Lehner was acquired along with David Legwand for the 21st overall pick in the days leading up to the NHL draft, but he suffered a high ankle sprain in the Sabres' opening game of the season and was out until mid January. He's posted a 2.30 GAA and a 0.932 SV% on the season, give Buffalo an upgrade in net over the Chad Johnson/Linus Ullmark tandem that combined for a 2.53 GAA and 0.916 SV% in his absence. Even with an impressive amount of roster turnover that's seen only 11 of the 23 man 204-15 opening roster remain with the Sabres club, there's still a lot of work to be done in Buffalo, but with young elite talent like Eichel, one of the best farm systems in the league, and likely another top pick in the 2016 draft the future is bright. - Elliote Friedman reported that the Calgary Flames inquired about the availability of Pens goaltending prospect Matt Murray but were told the 21-year-old goalie is not available. Murray should be untouchable at this point in his career, and with Pittsburgh fighting for a playoff spot he should arguably already be seeing action in the NHL beyond what today's recall is likely to provide him. - The Penguins also announced that Daniel Warsofsky has been sent to Wilkes-Barre for a conditioning assignment. Warsofsky has been out with a concussion sustained in an on-ice collision with a referee January 17th, and his injury allowed for Derrick Pouliot to get back into the Pittsburgh lineup. It's unclear what Warsofsky's role on the team will be when healthy, and he could find himself back in the Wilkes-Barre lineup when cleared for a return.